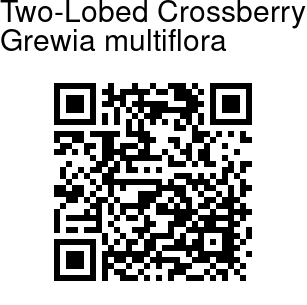 Two-Lobed Crossberry is an evergreen, large shrub to medium sized tree. Stem have dark brown bark, and young shoots have starry hairs. Leaves are lance-shaped, with 6-8 mm long stalk. They are 10-13 cm long, 3.5-5 cm broad, 3-ribbed, almost hairless, toothed. Leaves are narrow at both ends, long-pointed at the tip. Stipules are linear-lanceshaped, 4-5 mm long. Flowers are borne in 2-3-flowered cymes. Stalks carrying the flowers clusters occur singly or 2-3 together in axils, and are 1.5-1.8 cm long. 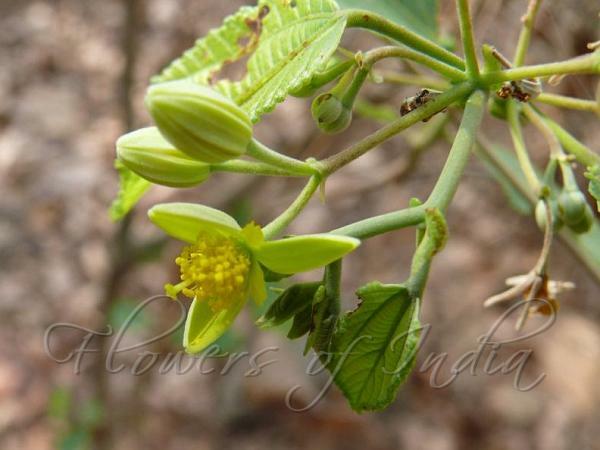 Flowers are yellowish-white, 2.5 cm across. Flower-stalks are as long as stalks of flower-clusters. Bracts are similar to and as long as stipules. Sepals are oblong, 1.2-1.5 cm long, 3-nerved, densely velvety outside. Petals are small, oblong-elliptic, 4-5 mm long, claw bigger than limb, with large gland covering the whole petal except the pointed tip. Stamens are numerous, filaments 4-5 mm long. Ovary is mostly bilobed, rarely more or less lobed, hairy. Style is longer than stamens, stigma with 1-4 laciniate lobes. Berries are mostly of 2, fused lobes, rarely entire or 4-lobed, lobes 6-8 mm in diameter. Berries are smooth, and turn black on maturity. Flowering: July-October.